So the two conventions I just attended were night and day. Jet City had a low attendance and although I got to meet a couple of very loyal Bohemian Nights fans and sold some comics, it ended up as the winner for the least amount I sold at any convention. 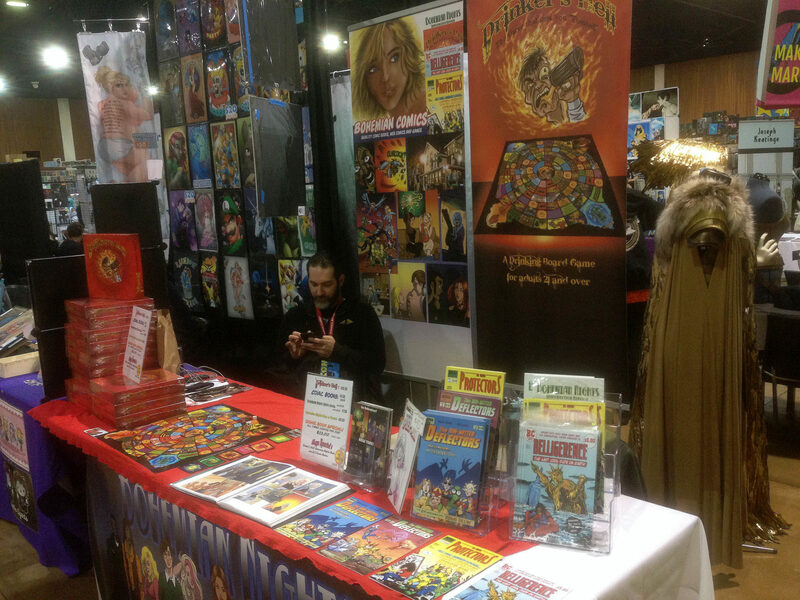 Where as Eucon I think was my second best convention ever, selling 11 games and nine comics. Another big boost was having a table right at the entrance as well as right across the way from long time comic artist Mike Royer who was amazing. 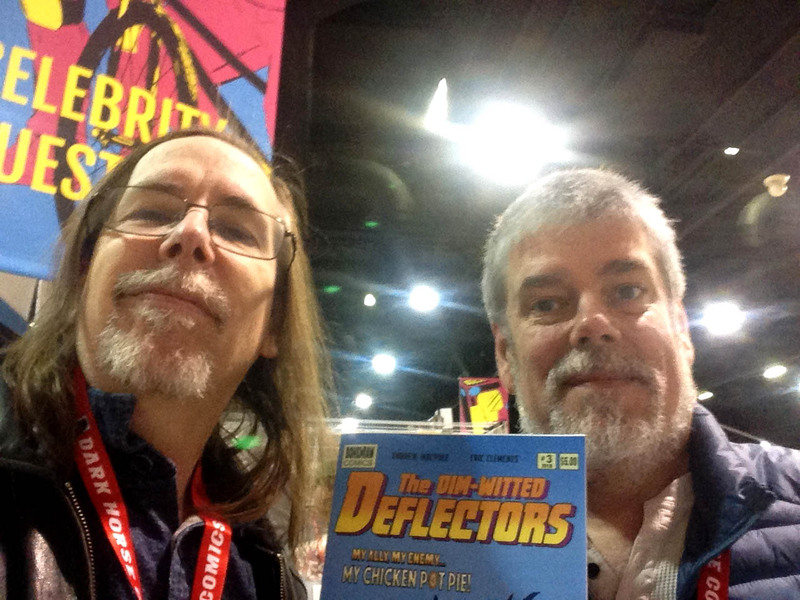 But the best part of the whole convention was being able to talk to Ming Chen and Mike Zapcic of Comic book men and showing them the comics me and Andy Macphee have been making (The Deflectors) and actually getting them to carry our comics!! So within a month, those people on the east coast (New Jersey) will find Both the Deflectors and Belligerence at Jay and Silent Bob’s Secret Stash comic shop. I was also asked to come on stage when they were on and give a quick shout out of the comics as well as recount the time I met Jack Kirby. Ming and Mike were incredibly gracious and friendly people. Andy and I are very much in their debt for allowing us to showcase our comic in their store. I’m still taking a leave of absence next year when it comes to comic conventions, with the possible exception of doing Eucon again. We’ll have to wait and see. It looks like Emrys was feeling a bit poetic, but it’s a cool voiceover effect that helps to illustrate that this is basically *his* story, even if it’s an ensemble cast. 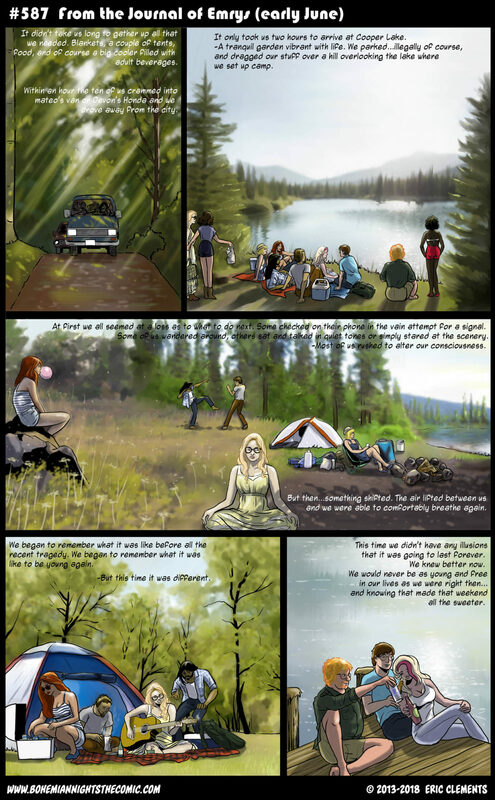 Most of the time we see events from a third person limited point of view, but it’s nice to get an inside look for a sequence like this so the story can keep moving forward. Yeah, Emrys got a little more poetic than he usually does. Chalk it up to poetic license, I guess. I think I’m Shannon- sitting and watching everyone. …thank you for this. Your comic is ever ringing true. Thank you very much.It always feels good to hear when something you create resonates with other people. When I go out into nature, I always get a good feeling I don’t get elsewhere. A kind of serenity. Cooper Lake looks beautiful, just the right place to go for that kind of calm and peace. I like to recharge the ol batteries in nature too. Puts everything in perspective.